The crumbling of the SPD’s resolve to enter opposition two months after its worst ever federal election result (20.5 per cent) was a demonstration of centripetalism at its apolitical worst. Enjoined by Federal President Frank-Walter Steinmeier – who in 2009 had himself been the second least successful SPD candidate for chancellor in post-war history – to put national stability before self-interest, the party had no choice: being seen as unwilling to take responsibility would have risked meltdown in re-elections. Tactical failings aside (for which Schulz paid the proper price, though German foreign policy is poorer for it), the SPD had at least for a while admitted the obvious: that ideological diversity is congruent and not incongruent with democracy, and that centrism risks producing the precise opposite of stability, namely democratic disaffection and parliamentary impasse.4 For its part, the CDU/ CSU (at 33 per cent, down almost 9 per cent) expressed no such doubt in the myth of disinterested politics. Following the collapse of coalition talks with the Greens (8.9 per cent) and the resurgent FDP (10.7 per cent) – caused by the FDP’s impression of being instrumentalised for the sake of a Green-CDU partnership – the Union made no secret of its preference for grand coalition and was willing to make major sacrifices for it to happen. The SPD leadership may have been justified in its claim that the coalition contract bore ‘social-democratic handwriting’: it succeeded in taking six ministries, including finance, and in securing significant social-democratic policy concessions, including in employment (fewer short-term contracts, lower social security contributions, an end to the ‘part-time trap’); families (affordable rents, full-day schools, free nurseries); and Europe (investment in jobs, European minimum wage, a ‘social pact’). Sure enough, when the coalition contract was put to vote in early March 2018, only 34 per cent were still willing to back ‘NoGroKo’. But the feeble victory in April’s leadership elections for leader-designate Andrea Nahles – a Lafontaine protégé and former minister for labour and social affairs (against outsider Simone Lange, who ran on an anti-Hartz-IV ticket5) – indicates that perennial tensions between the programmatic wing of the party and the pragmatist majority will persist. The rise of the AfD is often said to have been due to its ability to exploit the ‘representation gap’.6 The model is straightforward: established parties fail to react to popular concerns and instead persevere with narratives increasingly seen to be out of touch; this opens up space for protest movements and anti-systemic parties, which then enter parliament; established parties refuse to engage with the new parliamentary opposition, prompting the latter to block legislation and refuse parliamentary collaboration; anti-parliamentary parties gain more support, even leading to the impossibility of parliamentary politics as such. If the representation-gap model reflects the historical fears underlying German political culture, it is also a variant of the longstanding conservative solution for dealing with the far right. For many conservatives, Merkel’s greatest mistake is to have ignored the warning of CSU godfather Franz-Josef Strauss – issued after the victory of the Republicans in Bavaria in 1986 – that no democratically legitimate party can be allowed to exist to the right of the Union. The dictum can, of course, imply both pulling the right towards the centre as well as pushing the centre towards the right – as Merkel herself pointed out, after pressure from within the Union to restrict the right to asylum following the violent anti-refugee demonstrations in Saxony in August 2015.7 Christian Democratic principles, she insisted, could not be diluted for tactical reasons. And yet, up to and including the Kohl era, CDU policy had always been centrism at the federal level – anti-communism being the integrating factor – and advances towards the far right at regional and local levels.8 Indeed, since 2016 the Union has in fact been backtracking from its open-borders stance, primarily under pressure from the CSU, whose criticism of Merkel’s course throughout the refugee crisis nevertheless failed to prevent it making massive losses to the AfD in Bavaria in 2017. The promotion of Merkel critics to cabinet posts, together with insubordination further down the hierarchy – the so-called ‘WerteUnion’, an explicitly Merkel-critical group with a programme of unreconstructed nationalism, pre-1960s family values and Wirtschaftswunder economics launched in March 2017 – may be indications of a Straussian realignment in the CDU. Most telling, however, is the appointment of Horst Seehofer, the CSU chairman and previous Bavarian minister-president, as federal minister of interior and ‘homeland’. As we were going to press, Seehofer, a critic of Merkel’s open borders policy throughout the refugee crisis, was proposing to close Germany’s borders to immigrants previously registered in other EU countries, a move that has put Merkel on the back foot and may even threaten the viability of the coalition. Meanwhile, in Bavaria itself, the CSU, faced with the apparently certain loss of its outright majority in the state elections in October 2018, has resorted to stunts such as ordering crucifixes to be hung in every public authority building, and claiming, pace Merkel, that ‘Islam does not belong to Germany’. While coalition between the Union parties and the AfD remains unthinkable in the Bundestag, the idea seems increasingly less far-fetched at regional levels, especially in the East. The conservative provenance of the representation-gap model by no means diminishes its plausibility, however. It can hardly be doubted that the CDU’s initially hesitant alignment with liberal left Willkommenskultur (‘culture of welcome’) in 2015-16 alienated a large swathe of conservative opinion. As Robin Alexander, political journalist for Die Welt, detailed in his bestselling account of the handling of the 2015-16 crisis, Merkel’s decision-making was influenced by public opinion-polling like no other chancellor before her.9 According to Alexander: ‘Under Angela Merkel, the Federal Press Agency has changed from being an agency that informs the public about the work of government to an agency that above all informs the government about what the public is thinking’ (p67). Concerns to preserve Merkel’s image as the ‘refugee chancellor’, established almost accidentally at a key moment in the autumn of 2015, were what drove her open-borders policy, despite opposition from the CDU-held interior ministry and the security establishment, not to mention the CSU. The narrowing of the immigration and asylum question during the coalition negotiations to the longstanding and largely symbolic question of an ‘upper limit’ to refugee intake – demands for which Merkel has consistently refused – and its resolution in the euphemistic stipulation of a ‘range of between 180,000 and 220,000’ people per year, was an indication that entrenched political conflicts between the Union parties over immigration had by no means been resolved. The SPD’s crushing loss to the CDU in the May 2017 regional elections in North- Rhine Westphalia, in the course of which it lost its previous lead of almost 14 per cent, was widely seen to have sealed the party’s fate in the federal elections. This most populated and urbanised of western states was for many years an SPD stronghold, particularly among the working-class population of the post-industrial sprawl of the Ruhr valley. Although the CDU was the largest recipient of former SPD votes in NRW, a significant portion also went to the AfD, for whom former SPD voters became the second largest source of new votes – after non-voters. The result was an unmistakable rebuke to the SPD party chairman in NRW, Hannelore Kraft, who more than any other SPD politician had supported Merkel’s open borders policy. Between 2015 and 2017, North-Rhine Westphalia received by far and away the largest contingent of asylum seekers in Germany, and the AfD saw it as the negative example par excellence of the failure of the coalition’s refugee policy. The controversy in early 2018 over the decision of a food bank in Essen to turn away non-Germans showed how strong the potential is in the region for the ideologisation of tensions at the crossover between immigration, integration and poverty. There is good reason to think that NRW is indicative of similar conflicts across western Germany as a whole, particularly its less affluent regions. If the SPD is losing to the AfD in NRW, it urgently needs to start understanding why. However, the most graphic demonstration of the dilemmas posed to the left by the representation gap has been provided by Die Linke. The party received 9.2 per cent of the vote in 2018 – up 0.6 per cent – but this appearance of stability is misleading. Die Linke has undergone a major shift of voter profile, becoming younger, better educated, less socially conservative and more western. In the East (where its vote was 17.8 per cent, down 5 per cent), the party has been overtaken by AfD (21 per cent, up 16 per cent) as second strongest force; it lost almost as many voters to the AfD (420,000) as the SPD did. These lost votes were made up for in the West, where the party won 7.4 per cent (up 1.8 per cent from 2013), taking 700,000 SPD voters and 330,000 Green voters. Though Die Linke remain the smallest parliamentary party in the West, two-thirds of its MPs are westerners (it was 50 per cent in 2013), 40 per cent of whom are new. Replacing the older generation of the western wing of the party, made up mainly of trade unionists and former communists, the new MPs come from the social movement milieu and view the pragmatism of their eastern colleagues with suspicion. While Die Linke in the east traditionally prefer to govern, and are willing to work with other parties, the new western members of the Bundestag, particularly those associated with the Antikapitalistische Linke, are committed to ‘fundamental opposition’. The biggest question for Die Linke is therefore whether it can – or wants to – attract both groups of voters. The answer from the ‘national’ wing of Die Linke around Sahra Wagenknecht and Oskar Lafontaine has been a resounding ‘no’. From his outpost in Saarland in the furthest south-west, Lafontaine has issued a series of attacks on the party leaders Katja Kipping and Bernd Riexinger for the ‘open borders’ policy on which Die Linke fought the 2017 election. Immediately after the election, Lafontaine published a statement claiming that this had been responsible for the party’s poor results among the working class and unemployed – from whom it had received fewer votes than the SPD, CDU and AfD.14 Wagenknecht, who as head of the parliamentary group has for the past two years been embroiled in bitter conflict with the party leadership, dropped another bombshell in January 2018 by calling for a left-wing Sammelbewegung or grass-roots movement. 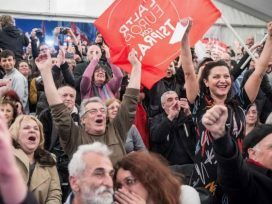 Originally mooted by Lafontaine as an equivalent to La France Insoumise (and not to be confused with calls for ‘Red2Greeen’, which have petered out in the face of coalition arithmetic and sheer lack of will), the ostensible targets of the movement were disappointed SPD voters in the West. Implicitly, however, the initiative was also aimed at errant voters on the far right. Wagenknecht retreated from the proposal after it was criticised, not just by the party leadership but also by former PDS leader and supreme pragmatist Gregor Gysi, as being divisive and top-down. The NoGroKo wing of the SPD also came out against it.15 And yet the idea of a Sammelbewegung continues to find endorsement, including recently from the economist Wolfgang Streeck. The potential for such an alliance undoubtedly exists, both in the east – where the AfD has emerged as a major competitor for the vote of the kleiner Mann, and where there is an overlap between Die Linke and the AfD on other ideological topoi: anti-globalisation, anti-Americanism and Russophilia – and in the less affluent, heavily urbanised states in the West. What is clear to Die Linke, at any rate, is that if it is to avoid the ‘ten per cent trap’ its project needs some form of redefinition. Others within the party have rejected trade-offs between social justice and immigration and called for a movement for solidarity at the centre.16 The party, they argue, must overcome its fixation on the white male working class and embrace gender, ecology and anti-racism; it must develop a new politics of class that overcomes the ‘false dichotomy’ between identity politics and social equality. But in any attempt to claim the liberal-left middle ground, Die Linke may run into competition with the Greens (8.9 per cent, up 0.5 per cent), now the smallest party of opposition. Despite successfully positioning themselves as the incarnation of Willkommenskultur and attracting well over a million votes from the SPD and Union combined, the Greens have not been unaffected by conflicts around immigration and refugee policy over the past two years. At the beginning of 2017, serious disagreements emerged between the party leadership and powerful conservatives at the regional level – particularly Winfried Kretschmann in Baden-Württemberg – over restrictions on asylum and the definition of safe countries of return. During the first round of coalition negotiations after the election, the long-mooted project of Green- CDU/CSU looked close to realisation; but since the collapse of the talks, this option has disappeared, and the influence of Kretschmann has diminished. The emergence of the AfD, as well as its eastern forerunner PEGIDA, has led to far-reaching questions being raised about the objectivity of the media’s handling of the far right and the requirements of media plurality.18 The discussion tends to be filtered through the perennial debate about the evaluation of historical National Socialism and its political successors, together with a very specific constitutional- legal discourse about the limits of free speech and other basic rights. These questions overlap with the substantive debate about how the far right is to be interpreted. If a journalist or editor sees the AfD as a front for neo-fascism, and therefore as something not merely to be reported on but also to be ‘resisted’, this will be taken as misconstruing the role of liberal media – and not just on the far right. Similarly, if PEGIDA is explained as a symptom of an authoritarian tradition in eastern Germany, this will be seen as evidence of the persistence of structural prejudice. Conversely, anyone who understands PEGIDA as a conceivable if misguided response to economic and cultural insecurity and the flawed immigration policy of the Merkel coalition risks being labelled as a sympathiser and shut out of the conversation. While coverage of the AfD will be seen by some as doing the far right’s publicity for it, others will see it as the appropriate response to a new and important political phenomenon – and so on. The re-emergence of the dilemma in the acute form that it takes today is primarily, of course, the result of the AfD’s exploitation of the neuralgias of German political culture. The difficulties that the German media, and the public sphere in general, have in dealing with the AfD stem not just from the latter’s systematic use of the reflexes of scandal, but also from its cultivation of ambiguity as regards its demarcation from outright fascism. To understand this, it is worth briefly looking at the genealogy of what is commonly, though perhaps misleadingly, referred to as the ‘New Right’. The emergence of the New Right in Germany – in parallel with the nouvelle Droite in France – was simultaneous with that of the New Left, whose anti-imperialism it ostensibly shared.19 From the early 1990s it began distancing itself from anything liable to associate it with the neo-fascist National Democratic Party of Germany (NPD), founded in 1964: overwhelming public consensus about the German past meant that Holocaust denial and outright criticism of Vergangenheitsbewältigung (coming to terms with the past) was seen within the New Right as being politically inopportune. The issue of historical guilt was instead to be avoided entirely, and racism and antisemitism replaced by so-called ‘ethno-pluralism’ – the confinement of ethnic groups within their national territories. Leading this realignment was the weekly Junge Freiheit, founded by journalist Dieter Stein in 1986. During the Kohl era, the New Right succeeded in penetrating well into the CDU: the current AfD co-chairman Alexander Gauland published articles in Junge Freiheit in the late 1980s and early 1990s, while a CDU politician. However, the advent of Red-Green and the consequent liberalisation of the CDU brought an abrupt end to this political influence, forcing the New Right to undertake a process of strategic reorganisation – from which, a decade later, it would greatly benefit. Two concepts began at this time to crystallise within the New Right: first, so- called ‘metapolitics’ – the definition of principles able to form the basis of political decision-making; second, right-wing ‘cultural hegemony’ or quasi-Gramscian capture of the ‘pre-political field’. Each concept correlated with the competing wings of the New Right that emerged around the turn of the century: on the one hand, a realpolitik circle around Junge Freiheit, which by the end of the first Merkel-led Grand Coalition in 2009 was advocating a party-political alternative to the right of the CDU; on the other hand, a radical circle around Götz Kubitschek’s ‘Institut für Staatspolitik’ (IfS) and the journal Sezession, which preferred an anti-systemic politics closer to the identitarian movement in France and the neo-fascist Casa Pound in Italy. The rift was only healed after the right-wing, völkisch turn of the AfD in 2016. Now, with a circulation of 30,000 a week (up from 15,000 in 2008), Junge Freiheit serves as something like the official organ of the AfD, supporting ‘moderates’ such as Gauland and Georg Meuthen, both westerners. Kubitschek and the IfS, meanwhile, are closer to eastern circles around Björn Höcke, with the IfS acting as a far-right think-tank and provider of ‘seminars’ for party members. Yet the boundaries between the pragmatic and radical wings of the AfD have also become increasingly fluid. While ‘relativisation’ remains the golden rule, revisionist tendencies have recently been again entering AfD discourse. This goes particularly for Höcke, who, speaking in Dresden in January 2017, lamented that Germany was ‘the only nation in the world to have planted a monument of shame in its capital’, and declared that the country needed to take a ‘180-degree turn in memory politics’. If provocation is one side of the AfD’s media strategy, then attacks on the so-called ‘system press’, ‘political correctness’ and the ‘corridor or the opinion’ are the other. And in the sights of the AfD, above all, are the public service media. In its 2017 election manifesto, the AfD demanded the abolition of the compulsory licence fee and the introduction of a pay-per-view ‘citizens’ broadcasting company whose supervisory board would be appointed directly by subscribers. The fact that the New Right accuses the media of bias does not mean, however, that media bias does not exist. Only 25 per cent believed that the media was providing a realistic picture of the proportion of young men among the refugees, and almost half believed that the media was failing to cover the risks of mass immigration; just over 40 per cent thought that critical voices had been ignored. A long-term study carried out by the University of Mainz, published in January 2018, showed that in 2016, 55 per cent of respondents believed to some extent that the German population was being systematically lied to by the media, and that 45 per cent of respondents believed either strongly or partially that politics and the media worked together to manipulate public opinion.24 By 2017, these figures had fallen to 42 per cent and 35 per cent respectively. Yet, in 2017, 71 per cent of respondents still agreed to some extent with the statement that, ‘in my personal surroundings I perceive the social circumstances very differently to the way they are represented in the media’, while 52 per cent agreed to some extent with the statement that ‘the media have lost contact with people like me’. A diffuse sense of alienation from the media clearly remains, even if trust has partially returned. These findings do not, of course, prove that the German media’s coverage of immigration has been deliberately misleading, let alone that it follows the agenda of a Social Democratic-Green cartel made up of former ’68ers. Yet there is reliable evidence that reporting on the refugee crisis did indeed entrench pro- coalition narratives and failed to represent the full bandwidth of opinion. A report commissioned and published by the Otto Brenner Foundation, led by media scientist Michael Haller, former senior editor at Die Zeit and Der Spiegel, made two serious criticisms of the way the liberal press had portrayed the events of 2015.25 First, as dictated by the routines of political journalism, the crisis had been treated overwhelmingly as a problem of institutional politics, rather than as a broad social- political problem. Two-thirds of all reports cited only representatives of institutional politics, while sources closer to the events such as aid workers and volunteers, experts with knowledge of migration, xenophobia or Islam, not to mention refugees themselves, rarely figured. Moreover, of the politicians cited, 43 per cent were active at the national level, 25 per cent were active in regional politics, and 20 per cent belonged to international political institutions, including the EU. The experiences of the communal politicians on the front line of the response to the crisis were largely ignored. On top of this came political bias: 80 per cent of all politicians cited belonged to one of the two major parties, while only 10 per cent of reports cited representatives of the opposition. When opposition parties were cited, the Greens occurred twice as often as Die Linke. This, argued the Haller report, allowed institutional politics to set the agenda during the crucial phase of the refugee crisis. The report’s second criticism concerned the failure of the press to take into account the opinions of sections of the population concerned about the impacts of the refugee wave or, when it did, its tendency to be censorious. Not only was there inadequate distinction between reportage and opinion, the print media also took on the role of political PR for the coalition. The career of the concept of Willkommenskultur supports this theory. The term first emerged in the 2000s in the context of calls from employers’ lobbies for immigration-friendly policy; indeed, habitual advocacy on the part of industry for qualified immigration was an important factor in the coalition’s open borders policy of 2015. 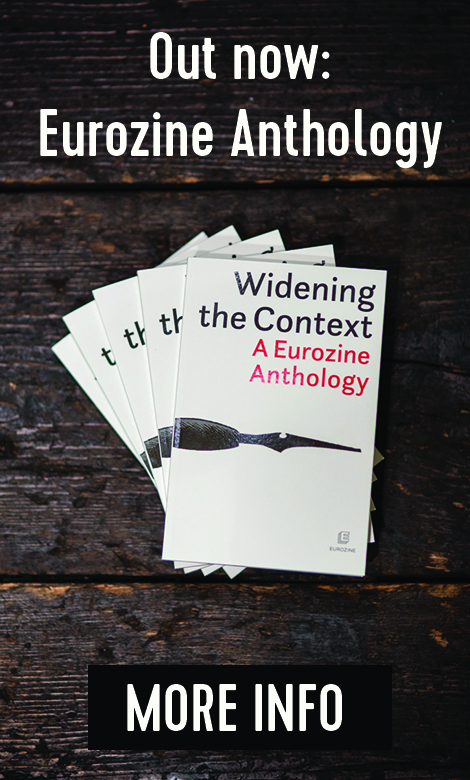 Even before the crisis, however, this primarily economic semantic had broadened to denote a more general pro-immigration attitude, and by 2015 the concept of Willkommenskultur had become so strongly normative that any dissent risked inviting charges of xenophobia. Then, after the sexual assaults in Cologne on New Year’s Eve 2015, the pendulum swung the other way, with male migrants now being cast under general suspicion – as if, Haller comments, journalists were trying to restore the balance. The fact that it took an event of such extremity to bring to journalists’ attention the deep schisms in German public opinion speaks of a serious dysfunctionality in media culture, he concluded. As more recent controversies have shown, the potential for conflict over questions of discursive plurality remains high. 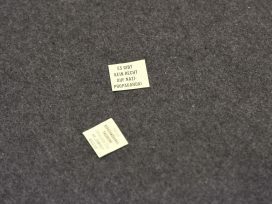 The disruption by Antifa of an event featuring Björn Höcke at the Frankfurt Book Fair in 2017 prompted an appeal signed by prominent figures of the New Right for the restoration of freedom of speech in Germany. The appeal was entitled Charter 2017, and included other references to civil rights rhetoric, something that was particularly controversial, especially since its signatories came largely from the East.28 A similar controversy broke in March 2018 around the publication of a ‘Joint Declaration’, again initiated by cultural circles in Dresden, expressing solidarity with ‘those demonstrating peacefully for restoration of the rule of law’ following the wave of ‘illegal mass immigration’. One of the most prominent signatories of both appeals, the novelist Uwe Tellkamp, had made inflammatory and inaccurate comments about the extent of economic migration, prompting his publishers – Suhrkamp – to issue what many regarded as an unnecessary disclaimer (no such reaction had followed Peter Handke’s speech at the funeral of Slobodan Milosevic in 2006, it was pointed out). At the other end of the spectrum, the view is that lending any kind of platform to the far right is to be deceived by its narrative of ‘exclusion’.31 Here, no substantial distinction is recognised between the ‘concerned citizens’ of the AfD and the neo-Nazis of the NPD; the far right, so the argument goes, must be treated not as political opponents on a level, liberal-democratic playing field, but as enemies of democracy. 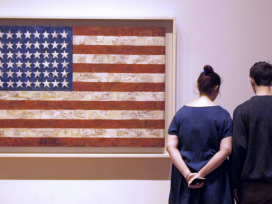 Pluralism is not to be mistaken for anything-goes: limits must be placed on racist and discriminatory discourse and politics; all else is democratic self-destruction. This position has the advantage of moral and constitutional rigour, but it is also unverifiable: or rather, the fact that it has been proven once means it shall never be proven again. However, on the very few occasions in the history of the Federal Republic when political parties have been banned and the exercise of basic rights has been curtailed, these decisions have appeared in retrospect as over-reactions with political pretexts: one thinks of the prohibition of the largely benign KPD in the context of the anti-communism of the 1950s, or the reactionary politics of ‘militant democracy’ in the 1970s (Berufsverbote etc). Only last year, Germany’s Federal Constitutional Court declined to prohibit the NPD, despite its racist violence and rhetoric, because, it argued, the NPD posed no credible threat to the liberal democratic system in total. Nor do advocates of excluding the AfD from media coverage seriously propose banning it, which one might see as the logical consequence of their position. Empirical problems in lumping the AfD together with the neo-Nazis of the NPD aside,32 there is also the fact that the AfD is a democratically elected, parliamentary party and largest party of opposition – a role whose importance no democrat could or should deny. Warnings about the dangers of engaging with the far right are nevertheless to be taken seriously, of course. For this reason, most liberal left voices support a middle way. 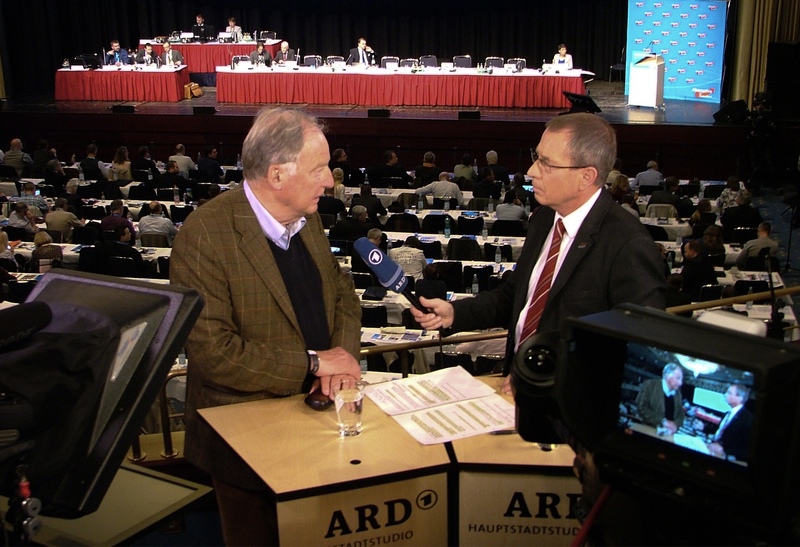 A 2017 report on the AfD and the media points out that taboos – or ‘political correctness’ – often express tacit consensus about the boundaries of discursive decency.33 Independent journalism, argues the report’s author, the media scientist Bernd Gäbler, must beware of blurring these boundaries through uncritical incorporation of far-right semantics.34 But the exclusion trap is also potentially dangerous. Instead, as the political scientist Claus Leggewie has sought to demonstrate through a publicised exchange with far-right ideologue Götz Kubitsheck, the liberal left must seek to understand, engage and argue with the opponent.35 ‘Talking to the right’ – the title of a recent bestseller – means confronting it on the level playing field of rational argument.36 At this point, the question becomes not whether to engage, but what the rules of engagement are and how to enforce them. The AfD’s appeal to a desire for homogeneity can in some ways be seen as merely an extreme form of the centrist reassurances of the political mainstream. The response to the AfD cannot therefore be more centrism.37 The other parties, far from ignoring the positions of the AfD, need to understand the underlying reasons for their appeal. These are not going to go away: there is no turning back the events of 2015-16. Just because the far right is talking about immigration, the issue cannot be seen by the democratic parties, particularly on the left, as contaminated, and not to be discussed. Equally, distaste for populist ‘form’ – its provocations, its vulgarity, its lack of appreciation for the institutions of post-war (west German) democracy, its parochialism, even its xenophobia – must not prevent engagement with populist ‘content’.38 One step towards regaining political trust and support for the parties of the left would be to address the different reasons for the appeal of the AfD in the parts of Germany where it is most popular – anxieties about the impact of immigration on existing arrangements for the redistribution of wealth in the affluent south west, and about falling behind once again after another exogenous shock in the still struggling east – and in both cases resentment at the fact of not being consulted. In Germany, however, distaste for populism is strong, particularly in the media, which has a historically ingrained sense of its pedagogic, progressive mission. Like it or not, however, the first step for the democratic parties and the public sphere at large is to take populists and their supporters seriously: ostracisation, despite its reassurances, will not make the far right disappear, and may even cause it to grow. If the far right subsequently continues to peddle its narrative of exclusion (and if one compares the situation in Germany to that in the UK, where there can be little question of media bias towards the left, then the suggestion is that it would), nothing will have been lost. On the contrary, the public sphere will be all the more plural for it. Democracy in Germany has little choice but to become more agonistic. The AfD received 12.6 per cent of the vote, thereby comfortably crossing the 5 per cent threshold that it just missed in 2013. See Jeremy Cliffe, ‘The New Germans’, Economist, 14. 4.18. See Albrecht von Lucke, ‘Die Gärige Republik’, Blätter für deutsche und internationale Politik, 1/2018. An allusion to AfD leader Alexander Gauland, who in in early 2016 described his own party as a ‘fermenting heap’. Schulz made two reversals which proved unacceptable to the SPD membership: the first was to enter coalition talks, having opposed them, and the second was to accept the post of Foreign Minister, having originally said he would not serve in a Merkel-led government. Because of intense criticism of these decisions he resigned, proposing Andrea Nahles as his successor. The Hartz labour market reforms, introduced by the Schröder government, are still highly controversial for their combination of punitive benefits levels, restrictions on personal freedoms and creation of state-financed low-pay sector. See Werner Patzelt, PEGIDA: Warnsignale aus Dresden, Dresden 2016, p43. The following is based on Patzelt’s model of the representation gap. See Robin Alexander, Die Getriebenen, Munich 2017, p44. See Frank Bösch, ‘Abgrenzen, eingrenzen’, Frankfurter Allgemeine Zeitung, 19.2.18. See Thomas Meyer, ‘SPD. Was nun?’, Neue Gesellschaft / Frankfurter Hefte, 1-2/2018. See Klaus Heinrich, ‘SPD: Der Absturz einer Volkspartei’, Blätter für deutsche und internationale Politik, 11/2017. The legality of Merkel’s decision to open the borders against the stipulations of the Dublin Agreement and without consulting either parliament, the opposition or even SPD cabinet members was criticised by the CSU (Horst Seehofer: ‘the regime of injustice’) and the AfD, but, at the time, not at all by the parties of the left. See Hans-Jürgen Urban, ‘Kampf um die Hegemonie: Gewerkschaften und die Neue Rechte’, Blätter für deutsche und international Politik, 3/2018. Nils Heisterhagen, ‘Linker Realismus oder Wo es brodelt, reicht und stinkt’, Frankfurter Allgemeine Zeitung, 20.11.17. Oskar Lafontaine, ‘DIE LINKE und die soziale Gerechtigkeit’, Facebook post, 26.9.17: www.facebook.com/oskarlafontaine/posts/1552437538151041. See Steffen Vogel, ‘Linke Sammlungsbewegung: Falsches Vorbild Mélenchon’, Blätter für deutsche und internationale Politik, 3/2018. See Michael Brie und Mario Candeias, ‘Linkspartei: Gegen das politische Vakuum’, Blätter für deutsche und internationale Politik, 11/2017. See ‘Grüne wollen neues Grundsatzprogramm’, Frankfurter Allgemeine Zeitung, 15.4.18. 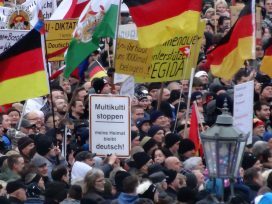 Patriotic Europeans Against the Islamisation of the West emerged in Dresden in the winter of 2014. See Volker Weiss, Die Autoritäre Revolte: Die neue Rechte und der Untergang des Abendlandes, Stuttgart 2017; Samuel Salzborn, Angriff der Antidemokraten: Die Völkische Rebellion der Neuen Rechten, Basel 2017. AfD, ‘Manifest 2017: Die Strategie der AfD für das Wahljahr 2017’: www.talk- republik.de/Rechtspopulismus/docs/03/AfD-Strategie-2017.pdf. See Bernd Gäbler, AfD und Medien, OBS-Arbeitsheft 92, 2017. European Centre for Press and Media Freedom, ‘Feindbild “Lügenpresse” lässt Übergriffe auf Journalisten steigen’, 15.12.15. Renate Köcher, ‘Mehrheit fühlt sich über Flüchtlinge einseitig informiert’, Frankfürter Allgemeine Zeitung, 16.12.15. Institut für Publizistik, Johannes Gutenberg Universität Mainz, ‘Medienvertrauen in Deutschland 2017’, 29.01.18:www.uni-mainz.de/downloads_presse/02_publizistik_ medienvertrauen_grafiken.pdf. Michael Haller, ‘Die Flüchtlingskrise in den Medien’, Otto Brenner Stiftung (ed. ), Frankfurt am Main 2017. The Otto Brenner Foundation is a research body connected to IG Metall, the Metalworkers Union. E.g. Rudolf Walther, ‘Die Fluchtlingskrise in den Medien’, Neue Gesellschaft/ Frankfurter Hefte 1-2/2018; Steffen Grimberg, ‘Das Ende der Deutungshoheit: Die Vierte Gewalt und die neue Macht der Vielen’, Blätter für deutsche und internationale Politik, 9/2015. See Patzelt, PEGIDA, 514ff (see note 6). On how this kind of appropriation is also favoured by the Alt Right in the US, see Annie Kelly, ‘The alt-right: reactionary rehabilitation for white masculinity’, Soundings 66, summer 2017. Mariam Lau, ‘Leise rieselt die Macht’, Die Zeit, 21.4.17. See e.g. Salzborn, Angriff der Antidemokraten, 186-198 (see note 19). On the distinctions between the AfD/PEGIDA and ‘classical’ neo-Nazis, see Hans Vorländer, Maik Herold, Steven Schäller, ‘Entfremdung, Empörung, Ethnozentrismus: Was PEGIDA über den sich formierenden Rechtspopulismus verrät’, Leviathan 2017. Bernd Gäbler, AfD und Medien, OBS-Arbeitsheft 92, 2017. Ibid, p39; see also Johannes Hillje, ‘Propaganda 4.0 – Die Erfolgsstrategie der AfD’, Blätter für deutsche und internationale Politik, 10/2017. See Claus Leggewie, ‘Versuch der Diskussion mit einem rechten Vordenker’, Die Welt, 13.01.17: www.welt.de/debatte/kommentare/plus161148647/Versuch-der- Diskussion-mit-einem-rechten-Vordenker.html. Per Leo, Maximilian Steinbeis, Daniel-Pascal Zorn, Mit Rechten Reden, Stuttgart 2017. See Jürgen Habermas, ‘Für eine demokratische Polarisierung’, Blätter für deutsche und international Politik, 11/2016: English version: ‘For a democratic polarization’: www.eurozine.com/for-a-democratic-polarization-an-interview-with-jurgen-habermas/. See Philip Manow, ‘Dann wählen wir uns ein anderes Volk … Populisten vs. Elite, Elite vs. Populisten’, Merkur, 4/2018.